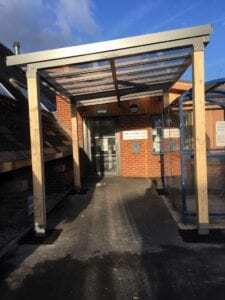 A new glazed canopy was erected over the approach to the main entrance to the Pool on 10th-11th January, providing a sheltered area for school children to wait during the change-over of classes, and protection for parents using the buggy store. The canopy was partly funded by money raised at the Chesterfield Half Marathon, so thank you once again to our fabulous runners and everyone who sponsored them. Further building work to upgrade our facilities is planned for later in the year.